I’m a big fan of nature, but there are certain kinds of nature I don’t especially care for: ticks, mosquitoes, skunks and snakes take turns at the top of the list. When people ask my husband how we’re settling in to our new home, he typically replies along these lines: “We’re doing well, except for some close encounters with nature.” This allows us to tell the dog v. skunk story, or talk about the dead rattlesnake I saw on a walk with the dog, or describe the coyote that seemed a little too interested in the dog and me a few mornings ago. I was sitting in the living room one evening last week, when motion in my peripheral vision caught my attention. I looked out of the window and could see something small, slender and silvery (very snakelike) dangling in the tree. I quickly realized it was a snake, possibly alive, in the bill of an owl. The owl didn’t surprise me. For several weeks in the evening, I’d been catching sight of an owl in those trees. It has even flapped overhead when I’m out for one last trip of the night with the dog. The snake part disconcerted me, though. I immediately Googled: Do owls eat snakes. The response wasn’t entirely reassuring. Yes, owls eat snakes (along with rodents and other undesirable critters—yay for owls! 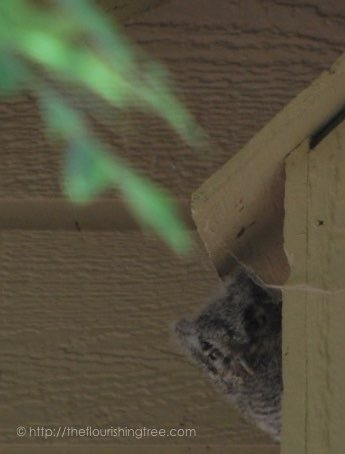 ), but screech owls may also bring a small, live snake to their nests to keep the nest clean of bugs and other critters. After that, I guess the owl probably eats the snake. I almost feel sorry for the snake. My overactive imagination conjured up snakes dropping out of owls’ nests onto my head. And then I wondered if I could just live inside for the rest of my life. Nooooo, I like outside too much. A little owl peeks out of its house. I’m not sure how I never noticed this house before, attached to the side of our house. But there it was, complete with a fluffy owl looking out—in the middle of the day. Aren’t owls supposed to be nocturnal? Was this one a fledgling, maybe a teenage owl trying to push the limits of its curfew? Is there a live snake in that box attached to my house? These questions whirled around in my head. I took two more pictures. When I emailed these photos to my husband, he said the owl looked angry in the last picture. “That’s why there aren’t four pictures,” I responded. I’ve learned that owls intimidate me. Is the one in the photo a juvenile? If not, why is it so fuzzy? Why is it awake/alert during the day? Will the mom and dad get protective of the nest in ways the dog and I may interpret as aggressive? Will it eat skunks (oh, pretty please, I hope so.)? Is it likely to drop live snakes from its house? Or will it eat the snake when nesting is done (oh, pretty please, I hope so.)? How long is nesting season? 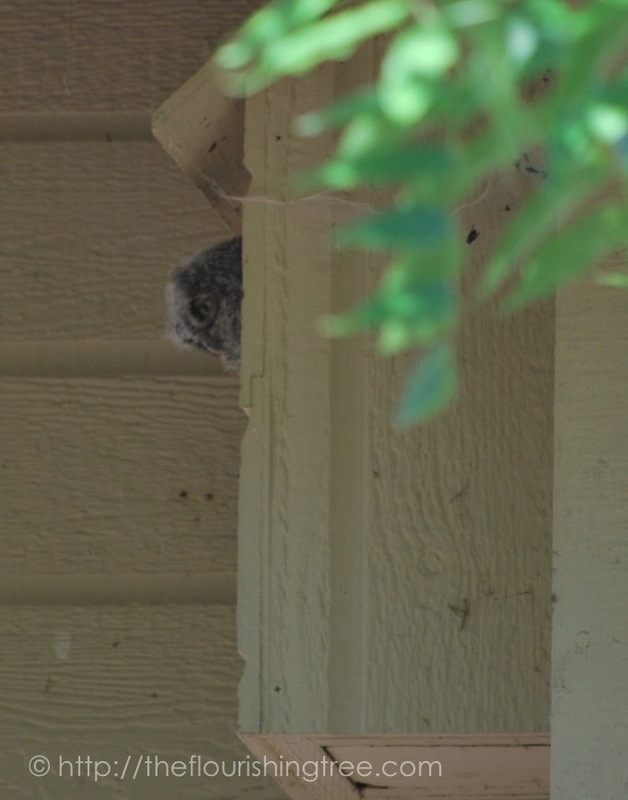 If you’ve had owls nest near (or on) your house before, what advice do you have? Or maybe you’re an owl expert and can help with some of these questions? I’d love to hear from you. 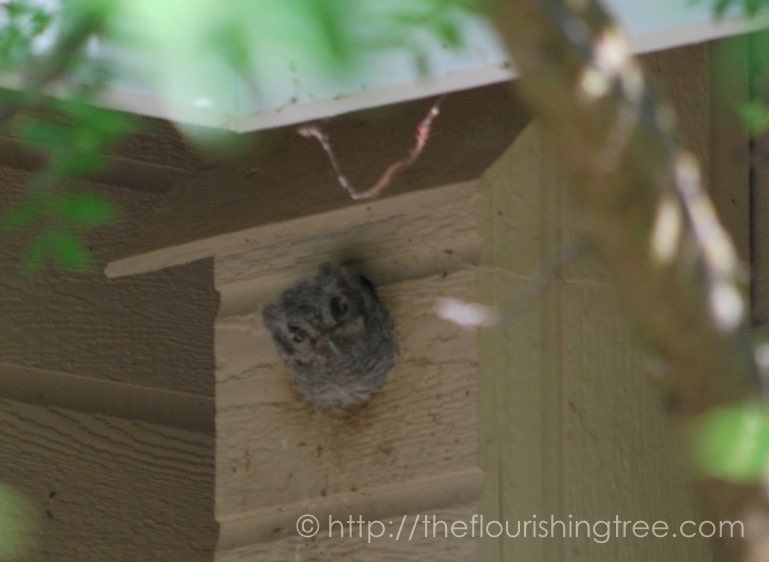 This entry was posted in flourishing tree and tagged bird identification, bird nest, critters, houseguest, nature, owl house, owl identification, owls, snakes, Western Screech-Owl by hopesquires. Bookmark the permalink. We’ll have to wait and see whether any owl experts stumble upon this post. I’m hoping for at least a few answers. It’s fun living next to you, too!